As a reminder, you can submit your first scene anytime before 11:59 p.m. PST on Saturday, February 3. We've changed the way you'll submit your scenes, but this should make the process easier for everyone. All you need to do is click here, answer a few questions about your submission, and upload your scene. Our first group call is Sunday, February 4, at 1:00 p.m. PST / 3:00 p.m. CST. At long last, we've reached the Resolution. 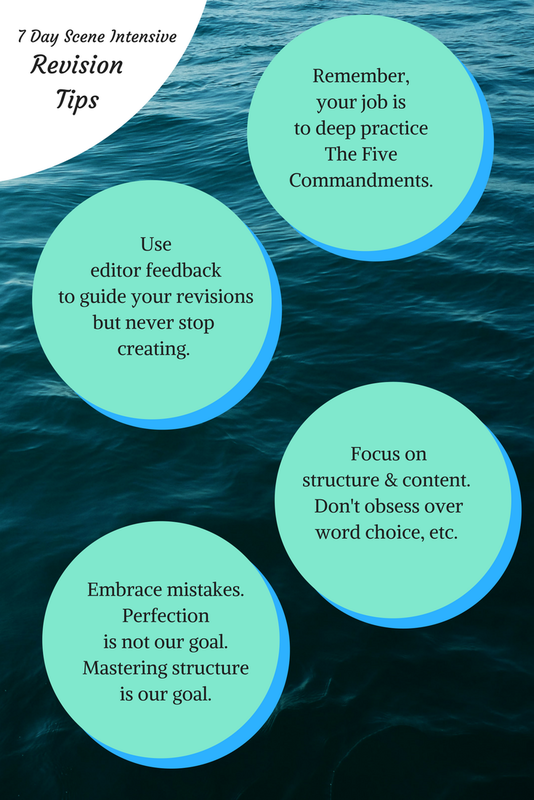 In this email, we'll review the Fifth (and final) Commandment of Storytelling and show you how to analyze your own scenes or those of a masterwork you want to reverse engineer. It's easy to imagine Robert McKee,master screenwriter and the author of Story, smiling cheekily when he says the Resolution is "anything left after the climax." It's true, but thankfully he goes on to explain what that entails. The general purpose of the Resolution is to wrap things up, but we need to get more specific if we're going write effective Resolutions. Generally speaking, the Climax will answer, not only the Crisis Question, but also the question posed by the Inciting Incident. If it's not been answered, and is not meant to be an open question, then the Resolution should clear things up. One thing the Resolution is not is a simple summation: If a character is restating what's just happened, they should illuminate the events and go deeper. Sometimes the Inciting Incident (or at least the setup for the Inciting Incident) of the next scene. Feel particular emotions related to the Core Emotion of the Story. When we analyze a scene, we identify the Five Commandments of Storytelling, but before we look at those elements, we begin with four questions designed to get to the heart of what's happening in the scene and how it relates to the Global Story. First, we start with an easy question. 1. What are the characters literally doing in the scene? This question is simple, straightforward, and based only on what you see. Leave out any judgments or interpretations. This should be an accurate, objective statement of what happens. Don't overthink or spend too much time dwelling on this. Record an answer and move on to the second question. This question is from Practical Aesthetics, an acting practice developed by David Mamet and William H. Macy. Actors use it to give themselves options. They know what they are trying to get the other character to do, which gives them concrete actions they can act out. Why are we talking about an acting concept here? Because identifying the Essence of the Character's Action will help you understand the scene better so you can revise it better. The goal is to capture the true nature of the action and the characters' intent. Consider what the characters hope to gain in the scene (What is the desire and goal that arise from the Inciting Incident?) and distill it into a pithy statement like those listed below. The next two questions look at whether and how the scene turns and how it relates to the Global Story. If you need to refresh your memory about Life Value changes, see the post on Progressive Complications and the PDF with genres, Life Values, Core Events, and Core Emotions. 3. What life value has changed for one or more of the characters? Like the first question above, you want to cast a wide net, but don't drive yourself crazy. Look for any change that happens in a life value for a character in the scene and record it. Consider different characters and their internal and external journeys within the scene. 4. Which life value is most relevant to the Global Story? If you were creating a Story Grid spreadsheet of the scenes in your story, you would enter the life value shift that is most relevant to Global Story, that is the main event. Don't worry about the spreadsheet now, but that is where you would put this answer if you were analyzing your manuscript or a Masterwork and how you would see it in a Story Grid Guide or Edition. Once you've answered the first four questions, it's time to check for the Five Commandments we've been studying. To find out more about Resolutions, check out this post from Shawn Coyne. We have three scenes that feature Captain Jack Aubrey and Stephen Maturin, the ship's surgeon. One important subplot involves their friendship and the way it is tested by Jack's sense of duty and the nature of living on a ship of the Royal Navy. In this scene, we see part of a lively dinner conversation in Jack's cabin. In the events leading up to this scene, Captain Howard of the Royal Marines accidently shoots Maturin while the HMS Surprise is anchored near the Galapagos Islands. Surgery is required to remove the musket ball from his chest before it festers, a certain death sentence. Jack abandons his pursuit of the Acheron while Maturin is taken ashore because the movement of the ship would make the operation unsafe, so Maturin, Aubrey, the surgeon's assistant, and others go ashore. Maturin informs the others he will perform the surgery on himself with a mirror. This scene is part of the Resolution of the Story. Jack and the crew of HMS Surprise have defeated the Acheron in battle. At the end of it, Jack receives the deceased captain's sword from the French doctor. Jack puts LT Pullings in charge of the Acheron with orders to sail for Valparaiso, parole the prisoners, and then meet in Portsmouth. Jack plans to return to the Galapagos to allow Maturin time to draw and collect unique species from the islands before setting sail for England. Identify the Resolution, what it demonstrates, and what it offers the reader in the live scenes above. Analyze one of the live scenes using the four questions, and then identify the Five Commandments of Storytelling within the scene. Remember from Progressive Complications email that the Turning Point Complication forces the character into a dilemma? Well that dilemma in question form is what we call the Crisis. The character has exhausted every reasonable option to achieve their goal except the two presented by the dilemma. This is the character’s last hurrah. Best Bad Choice: This is just what it sounds like—a choice between two unpleasant (or much worse) options. Taken to the end of the line, I think of Sophie’s Choice, a story in which a woman must decide which of her children will live. How could a person make that choice? That’s one of the reasons we go to story: We face difficult decisions in our lives, though thankfully for most of us it’s nowhere near that heartbreaking, and we want lessons for life about how to choose. Irreconcilable Good Choice: This can present as two good options when the character can’t choose both, OR a choice that’s good for the character, but bad for someone else. For example, in Pride and Prejudice, Darcy faces an irreconcilable goods crisis about whether to intervene on Lydia’s behalf after she runs away, unmarried, with Wickham. If he avoids the situation, his reputation and status remain intact, and that’s good for him. If he saves Lydia from her mistake, he helps Elizabeth and the other Bennet girls. These choices can be a bit "squishy" as Shawn Coyne says. Sometimes it’s a matter of perspective and whether the character sees a glass as half-full or half-empty. We could frame Darcy’s choice as being a Best Bad Choice, but that label won’t change the critical significance of the decision he faces: He can’t have it both ways, and it’s a difficult decision to make. A simple choice between good and evil isn’t a real dilemma. How the character responds in these critical moments tells us a great deal about who they are, and making the dilemma specific to them will make for more compelling stories and scenes. Specificity comes from in part from knowing what’s at stake. For example, consider the dilemma of a whistleblower in a cigarette company during the 1970s or 1980s. They risked losing their jobs as well as the possibility for future employment. If a character is single, independently wealthy, and skills marketable outside the industry, then the character wouldn’t necessarily agonize over the decision to speak up about the harmful nature of cigarettes. Give that character a family, mortgage, and no other skills, then it becomes a more difficult choice. Stakes are not only about how what the actual risks are, but what it means for the character. For some people, death or the death of a loved one is the worst thing that could happen. For others, it might be moral disgrace or failure. If you understand and convey what’s on the line and how the character feels about it, you’ll write more powerful scenes. By being specific about the character’s dilemma, you create a situation that anyone can relate to. So, think about your own dilemmas in life, the times when you faced best bad choices or choices between irreconcilable goods. This is the essence of writing “what you know.” Tap into your experience of facing these kinds of decisions let that inspire your writing. As Robert McKee says, the dilemma should be “dramatically” obvious. This doesn’t mean the dilemma needs to be explicit, though sometimes it is. It rarely is in films or in written stories where we don’t have access to the character’s thoughts. But the context or subtext should make it clear that the character has to decide between two main options, and that it’s difficult. Sometimes a character will serve as a herald and say it out loud. In our Master and Commander scenes, the sailing master, John Allen (played by Robert Pugh), often fulfills this role. While we focus on scenes for the Intensive, we want to remind you that scenes are connected to the Global Story. The dilemma within a scene should, of course, impact a character’s scene goal (the one that arises from the Inciting Incident), but it should also be related to the Global Story Objects of Desire or their Needs and Wants. This means that whatever the character decides should bring them closer to or further from that goal. To find out more about Crisis Questions, check out this post from Shawn Coyne. In this post, Shawn talkes about Best Bad Choices. How would you frame this Crisis? Best Bad Choice or Irreconcilble Goods? Why? What seems to be at stake for the character? We’d love to hear your thought process on this one. You can reach us at hello@writership.com. Set a timer for five or ten minutes and write about a time when you faced a difficult decision. How did you make the decision? What did you consider? We’ve got more posts coming before Saturday night, but before it's time to submit, we want to take a moment to explain exactly how the Intensive will work. Your submission can be a scene from a work in progress or a scene you've written just for the Intensive. The ideal length for scenes in this Intensive is 1,500–1,800 words. Please let us know if that will be a challenge. Word Docs or Pages files are easiest for submission, but let us know if you need to use a different format. We'll upload the scene to Google Docs and share the link with you along with our written feedback and suggestions by noon PST the following day. This will allow us to respond to comments and questions right in the document. 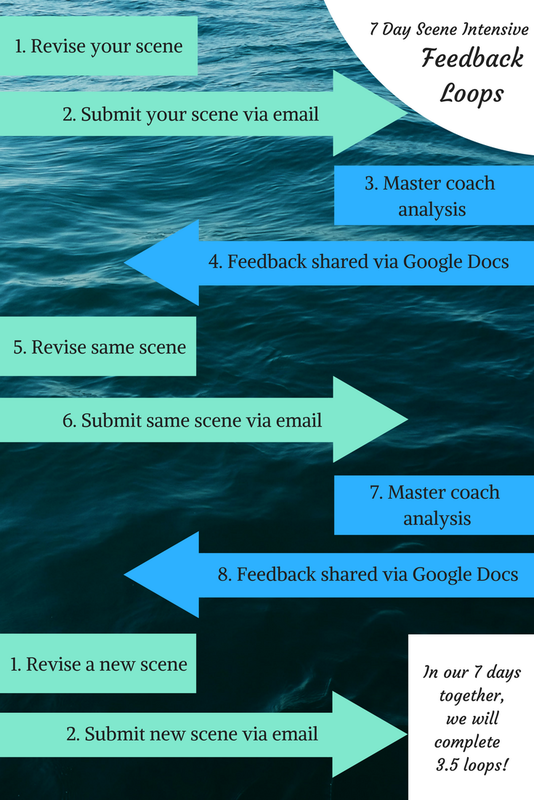 You'll revise the scene (either in the Google Doc or in your own document) and resubmit via email by midnight PST. (We'll save the different versions in a file we'll share with you, so that you can review your progress. We strongly recommend that you submit your scenes for at least two rounds of feedback. You can submit between two and four different scenes during the week. Here’s a visual representation of how this will work. In case you missed it, here is a survey to help us pick the best time for our upcoming calls. Please take a moment to fill it out and let us know your preferences for meeting times. Any questions? Write us at hello@writership.com. Today we look at the first Commandment of Storytelling: the inciting incident. This is an event that upsets the balance in life or the status quo and is a catalyst for everything that follows within the scene or other unit of story. To get a clear sense of this, consider the basic story structure former Pixar story artist Emma Coats, has shared. Within the bones of this fill-in-the-blank story, the sentences that start “Once upon a time” and “Every day” describe the status quo. “One day” is the inciting incident when things begin to change. You can also think about the inciting incident as the call to adventure within the hero’s journey. The purpose is to kick things off. The event throws the character or their life out of balance. The desire to reset the balance arises within the character. This desire becomes a goal the character believes will reset the balance. The goal could be an attitude or belief, the acquisition of some object, or a change in circumstances. The character takes action in pursuit of the goal. These elements won’t always be explicit, but the reader should be able to see them within the subtext of the story. Check out this article from The Story Grid site about Inciting Incidents:Commandment Number One. It’s not too early to be thinking about which scenes you want to work on during the intensive. Your first scene submission is due Saturday, February 3, 2018, at 11:59 p.m. Pacific time. Don’t worry, we’ll remind you again before then. In the meantime, and as you work through the pre-course materials, think about how these topics might apply to the scenes you want to submit. Remember, you’re free to write fresh scenes if you want, but you can also use scenes from a work in progress. Think about a story you’ve read or watched lately. What event kicked things off? Can you identify the four elements? In the context of your own life, consider the inciting incidents you’ve experienced. Look at small and large events, causal and coincidental, positive and negative. How did you feel when you were in the middle of the event and afterward? Remember that you can use your reactions and emotions to inform what your characters say and do in similar circumstances.